Concrete stilts support the elevated walkways which link the 34 suites to the main complex. Mango, coconut, and frangipani trees line the paths, and their fragrances fill the air. All suites have authentic alang alang thatched roofs, spacious marble bathrooms, and coconut wood, rattan, and bamboo décor. Tan and cream tones create a warm, sensual ambiance. Private decks have a daybed and dining table, ideal for relaxing and eating at any time of day or night. Resort facilities include two restaurants and a bar, spa services, a library, gallery, gift shop, well-equipped beach club, and an expansive pool area. 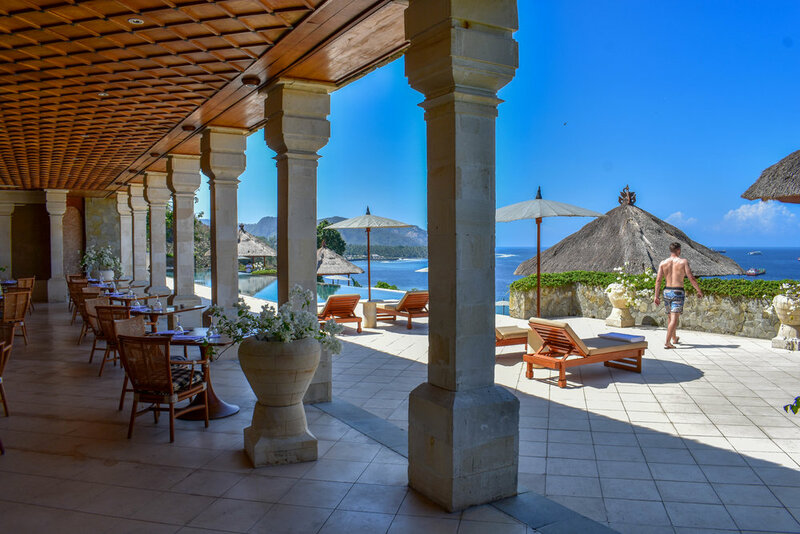 Set above the pools, the primary alfresco dining venue offers Balinese and International cuisine. Executive Chef Shane Lewis highlights the regions bounties utilizing native Indonesian cooking methods, such as slow cooking and grilling with coconut husks. Afternoon tea, served by the library, features handmade Balinese cakes, “Kopi Bali” coffee, and ginger & honey tea. You’ll have the opportunity to chat with young girls from the local village and watch them create ornate offerings. Reserve a few hours to relax by the breathtaking three-tiered pool. Lounge chairs are plentiful, and the pool staff treat you like royalty. They’ll happily deliver whatever you desire – from magazines to freshly caught lobster. The staff anticipate your needs and provide you with what you want before you get the chance to voice it, like a refill on ice water and a cold towel slightly scented with jasmine. Stylish pool-side cabanas provide respite from the sun and are a comfortable way to soak up the heavenly atmosphere. A steep five-minute walk or on-demand buggy ride transports you down to sea level to the Beach Club, where you’ll find a coconut grove fitted with hammocks, swings, fitness equipment, and a soccer field. Wispy trees create ever-changing reflections in the 135-foot-long lap pool. On the other side of the pool lies an enchanting black sand beach. Made of volcanic minerals and lava from Mount Agung, the sand is surprisingly soft, and the specks of black and silver glisten in the sun. Take advantage of the waterfront activities, such as paddle boarding, kayaking, sailing, and boogieboarding. Signature experiences include visits to ancient palaces and lush gardens, romantic hilltop picnics and bonfire beach dinners, cooking classes, village encounters, trekking, and cycling adventures. If you’re into snorkeling or scuba diving, charter the Aman XII - a 50-foot traditional outrigger equipped with a plush cushioned top deck. Cruise around Amuk Bay and enjoy a sumptuous champagne breakfast or light lunch after swimming besides an array of sea life. Expect attentive, unobtrusive service, as with all Aman properties. Over three-fourths of the employees have been there since the resorts inception over 25 years ago, and their genuine happiness radiates. Along with the welcoming staff, the sprawling and secluded grounds make it feel like a home away from home. 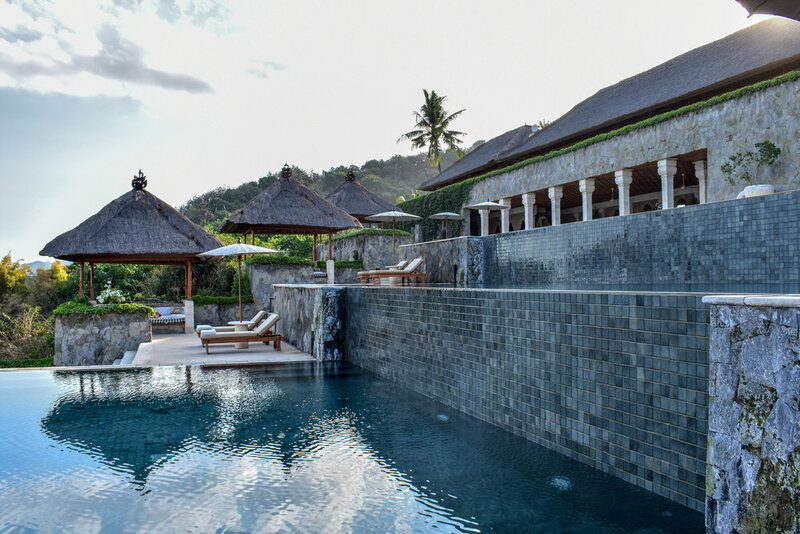 Amankila will leave you inspired and rejuvenated and is an idyllic haven to end a Balinese vacation.